Brussels: Fans of Belgian giants Standard Liege on Sunday caused outrage when they unfurled a banner showing a mocked-up image of former captain Steven Defour being beheaded. 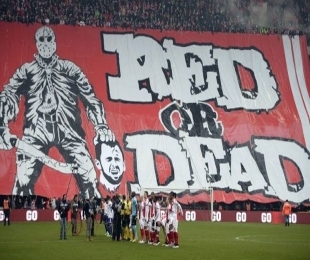 The sick banner showed a masked man holding a blood-covered machete in his right hand and the severed head of Defour in the other. It was accompanied by the words "Red or Dead" (red is the colour of Standard). Defour was playing for arch-rivals Anderlecht in the game which his new side lost 2-0 and ended with him being sent-off. The Belgian, who skippered Standard to two Belgian league titles, joined Anderlecht earlier this season after three years with Portuguese club Porto, a switch which caused widespread anger in Liege. Steven Defour is sent off after kicking the ball at the home fans. "This banner was in bad taste and unacceptable to Standard and Anderlecht," tweeted Bob Madou, the Belgian football federation's communications chief. "There is nothing in the rules against it but we will see what we can do about it," he said. Thibault De Gendt, the director of the tournament, condemned the actions of the Liege fans. "It was disgusting and this took place in front of children. We hope never to see this again," he said.